In Word 2003, I need to customize a multi-level numbering scheme that matches the one on the attached file. So, for level 1, I need roman numerals Centered, for level 2, headings I will need them to number, 1.2, 1.2, etc (left aligned), and for level 3 it would be 1.1.1, 1.1.2, etc. And each of thest first numbers of the subheadings would have to reflect the number of the level one heading, so under my second level 1 heading (II) level two would be 2.1, 2.2 etc. So autonumber would have to be in effect when I pressed enter on a certain heading to keep the numbering consistent. If you right-click the number.. You should be able to use a custom-numbering format.. 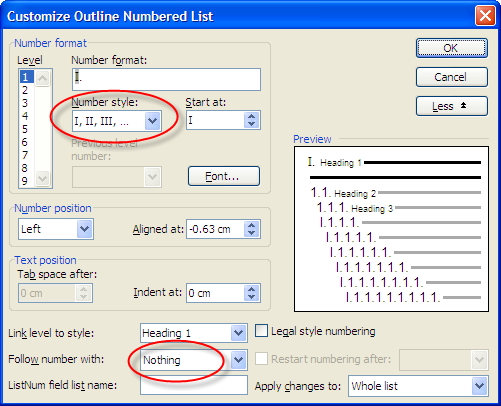 It is called "Define New Number Format"
Then select the Heading 1 style, click Modify in the formatting pane > Format button > Numbering > Customize > select the I, II, III numbering style. Select "Follow number with" > "Nothing". Click OK until you're back in the document. 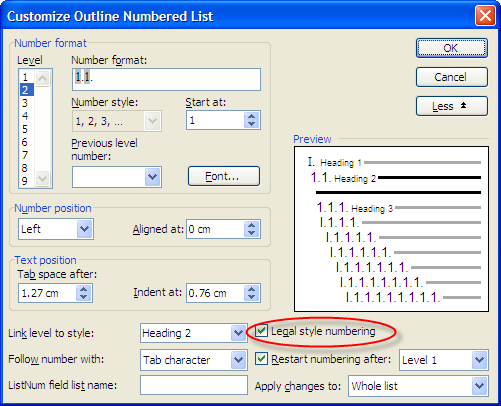 Select a heading 2 paragraph and modify the style with Modify > Format > Numbering > Customize > Select the Legal Style Numbering tick box (see screenshot) and click OK.
Repeat the last step for all heading levels you require. Format the styles to the desired font and indenting. When you enter a Heading 1, apply the style, and after the Roman number hit Shift-Enter twice to get the text on a new line.